This. This right here is why people are freaked out by clowns. Something in their childhood pushed them, tormented them. Coulrophobia. Fear of clowns. It's got an actual name. 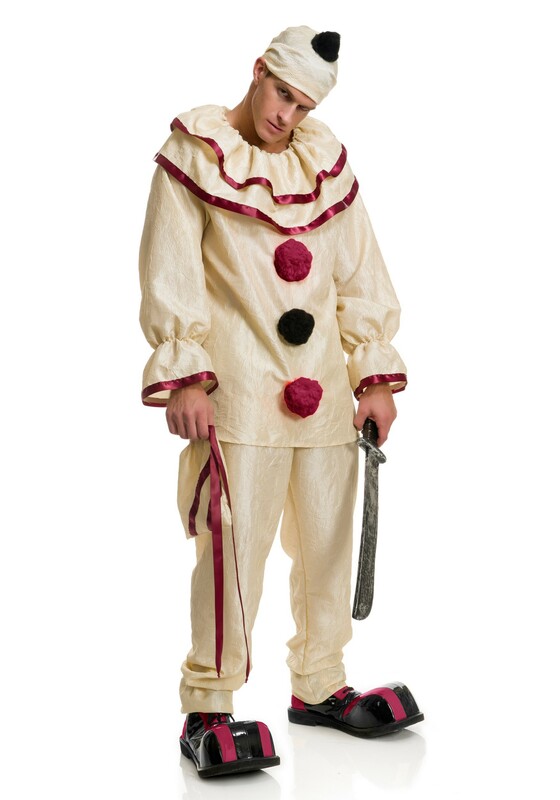 In fact, 12% of adults in the United States are afraid of clowns. That's a lot of people who shake in their boots at the mention of Bozo, Emmett Kelly, or Grimaldi. They start to sweat at the idea of 12 people crammed into a miniature car or a phone booth and even panic when they hear the toot-toot of a bicycle horn under the Big Top. Sure, this costume looks fairly straight-forward. Just a simple polyester shirt that ties in the back and features cheerful pom poms on the front. Strait jackets tie in the back -- #JustSaying. The puffy collar and gathered sleeves seem innocent, even jovial, but they are just there to put you at ease, to lull you into a false sense of security. Look at him. He wants you to think, "Meh - it's just a clown. Clowns are nice" and then -- BAM -- he's got you right where he wants you! And, this costume comes with a bag. Why does he need a bag?! What does a clown have to put in a bag?! Torture devices? The personal effects of his victims? If you look at your computer screen right now, are his eyes following you? Yup. Officially freaked out.